Dreams or nightmares do come true. Finally I was able to get a skull baking pan. This one has six good size skulls, it’s a great quality. I got it on Amazon from Nordic Ware. Wilton has a pan that makes three skulls with skull backs to make a full head. I don’t have that pan so I can’t speak on its quality. 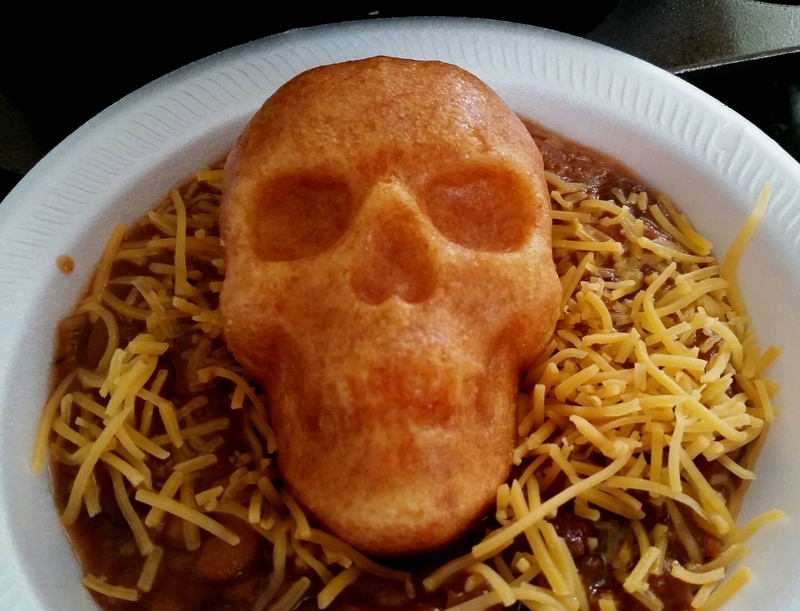 So far I have made corn skull bread, banana nut skulls, and skulls in a blanket. 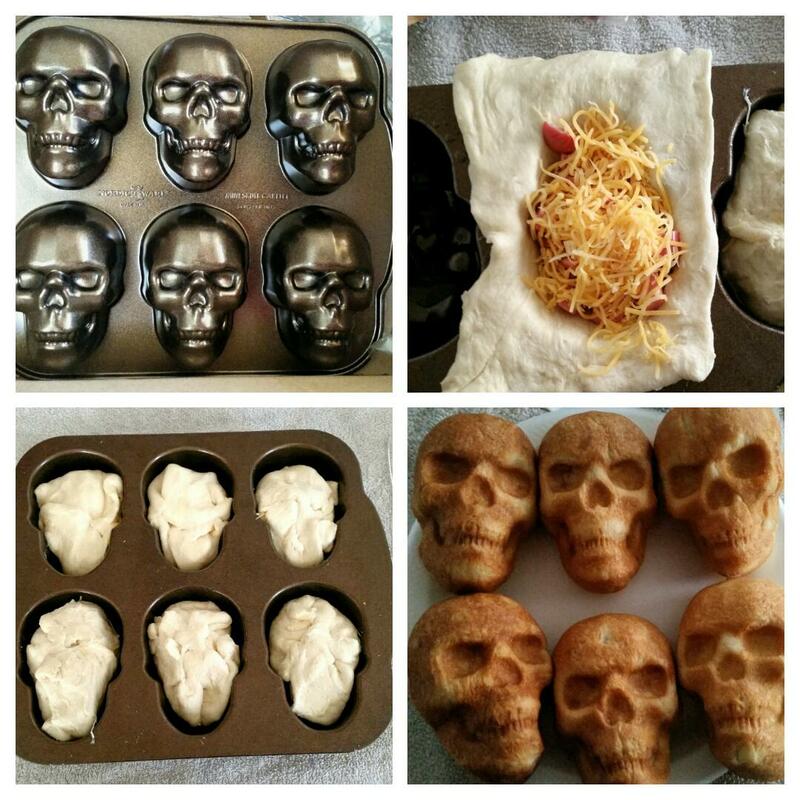 Skulls in a blanket is a simple recipe I made the day my pan arrived. Heat oven to 350 degrees. Spray the pan with cooking spray. I use a coconut oil cooking spray. Cut up the hotdogs into bite size pieces. Each skull will need 2 of the crescent triangles. Pinch them together along seam. Lay over empty skull, don’t worry pushing it down into pan. The weight from hot dog pieces and cheese will do that for you. Add hotdog pieces and cheese. Fill that skull up. Fold over the dough sealing up the filling. Bake for 13 to 15 minutes. Take out of oven, let sit a few minutes then flip out onto a plate. Enjoy. 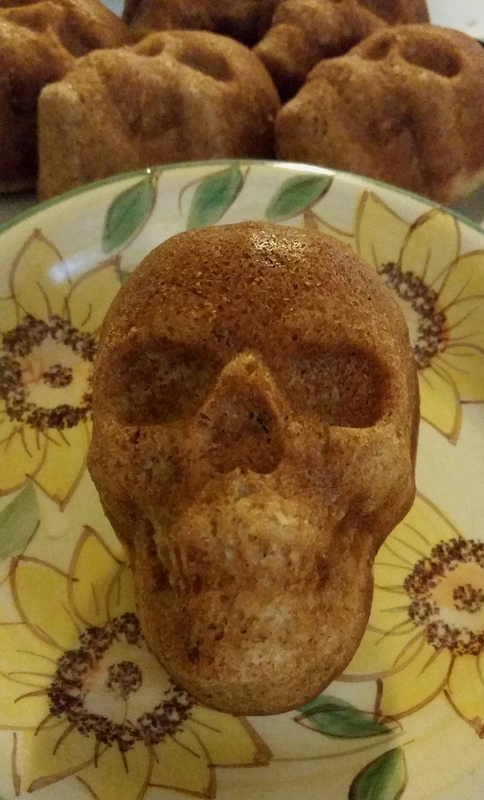 The banana nut skulls just use your favorite banana bread recipe. I divided the all the batter between all six. Bake the amount of time you bake muffins, most recipes call for 375 degrees for 20 minutes. Cornbread bakes up the same. I have not baked any cupcakes in the pan yet so I’m not sure how full to fill them so they don’t overflow. Tonight I making pizza skulls which is made like the skulls in a blanket but using pizza ingredients. I am looking forward to using this pan for all my holiday baking. Halloween, Thanksgiving and Christmas. Oh yes my baking has just gotten pretty Pinteresting.